The Total Return approach (aka “Systematic Withdrawals”, “4% Rule”) is a holistic way of managing your entire retirement portfolio. Instead of having different allocations for all your accounts, there is one main asset allocation that is implemented across all of your accounts (similar to a pre-retirement portfolio). A pre-determined amount would be withdrawn from the portfolio each month. This would be set up to automatically occur on a specific day of the month, essentially recreating a steady paycheck. It is called “Total Return” because it relies on all facets of return (dividends, interest, capital gains, and principal) to create the income stream. Once an acceptable withdrawal amount has been decided on, there is one more step before investing the assets – determining the Portfolio Income Buffer. If you just invested your assets and started taking monthly withdrawals, every month you would probably need to make several trades to free up cash for spending. That is very inefficient. For one, you might be forced to sell an investment when its low if the market was down. You would also incur more transaction costs and possibly more taxes. And, it could take up a lot of your time. The Portfolio Income Buffer solves these problems simply by keeping more cash on hand. With more cash on hand, you wouldn’t generally need to trade as much, therefore decreasing transaction costs and possibly taxes. It also “buffers” you from having to sell an investment that has declined in value to free up cash. The Portfolio Income Buffer is usually built right into existing accounts, so there's no need to set up additional accounts. The Portfolio Income Buffer is usually viewed as the number of months of available cash you have to cover the monthly withdraw. If your monthly withdraw is $5,000 and you have $60,000 of cash on hand, then your cash buffer is 12 months. A typical buffer amount is 2-6 years, depending on your comfort level. The shorter-term part of the buffer is usually in money market and laddered short-term CDs. The longer-term part of the buffer would hold laddered short-term bonds and target maturity bond funds to increase yield. Dividends and capital gains, instead of reinvesting like in pre-retirement, would now flow to the Portfolio Income Buffer to help replenish it. Periodic trades also help replenish the Portfolio Income Buffer and keep the overall portfolio balanced. Once the withdrawal amount is known, and money has been set aside for the Portfolio Income Buffer, the rest of the portfolio is invested per the diversified allocation. If you had 5-6 different accounts, each account would hold different investments, but together they form the overall allocation. This allows for greater tax management. Some investments produce more taxable income while others produce more capital gains. These investments can be placed in the type of account (taxable, tax-deferred, tax-free) that would be the most beneficial for the situation. Rebalancing is also simplified. If small-cap stocks grew over-weighted, instead of trimming the position in 5-6 accounts, you may only need to do it in 1-2 accounts. That can save on transaction costs and taxes. 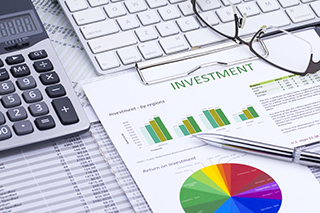 The investment portfolio is the main driver of growth and income. Periodically, money is taken from the investment portfolio to replenish the Portfolio Income Buffer. Withdrawals from the Portfolio Income Buffer provides a steady monthly income to your bank account for living expenses. It also buffers this income stream from the volatility of the markets (your income stays the same no matter which way the market moves). The concept may be difficult to understand. Some people don’t relate too well to the all-encompassing portfolio. They may see a sort of confusing “slush fund” when in fact, the chaos is more organized. It’s important to keep in mind the role of the Portfolio Income Buffer, especially during down times. There are no guarantees. This is usually the biggest concern. Markets go up and they also go down. The Portfolio Income Buffer can protect the income stream from volatility, but not the overall portfolio. Your portfolio will go up and down, so you’ll need to manage your emotions. If the Portfolio Income Buffer is running thin in a prolonged bear stock market, bonds are still probably doing OK. Instead of selling depressed stocks, you would sell bonds to replenish the Buffer. In 2008-2009, this strategy worked very well for retirees. They didn’t need to sell stocks during the Financial Crisis and we’re able to ride them back up through the recovery. Management is key. A Total Return portfolio is not a “set it and forget it” strategy. There are a number of ongoing issues to keep in mind (below), although guidelines can help you manage these. How often and when should I adjust my monthly withdrawal? Is my withdrawal rate too high or too low, and how should that change over time? When should I rebalance the portfolio? Should my allocation change over time? What account(s) should I take withdrawals from? How low should I let my Buffer get before making trades to replenish? Besides asset location, how else can I minimize taxes? Cash can be a drag. A larger cash position will lower returns during rising markets, but help buoy them during declining markets. It’s a trade-off of buffering the cash flow. Flexibility is good, until it’s not. The Total Return approach allows for the most flexibility. That means the strategy and portfolio can be easily changed. It also means that assets aren’t locked up (either physically or mentally) like with other approaches. This liquidity could lead to spur of the moment vacation home purchases or other unplanned expenditures which could affect the overall retirement plan.